"A single bed cover made up of squares and recrangles of woollen fabric pieced together by a Vicker Sewing Machine from Myer Melbourne. The fabrics are either new (left over scraps) or used (unpicked woollen garments). The backing is an old (used) candlewick bedspread. There is no padding. It is faded and worn due to being used for other purposes later. There is a 66 cm high clown that ahs been appliqued on mainly by hand using blanket stitch. It is also made from scraps of fabric. The hands were cut from an old felt hat." 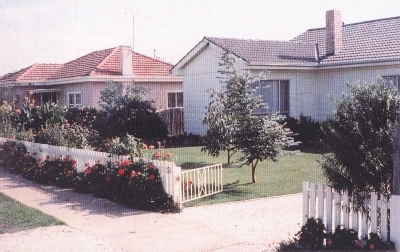 Made by Barbara McCabe while living in Echuca in 1965-1966. Owned by Barbara McCabe. This quilt was known as Michael's quilt. It was superseded within 4 years of having been made. Up until recently it had been used to pack around furniture being moved, and was treated roughly. 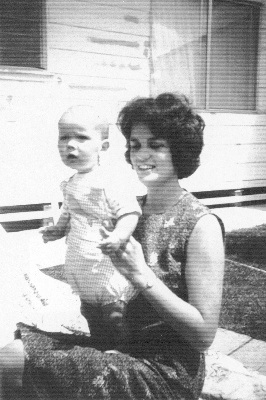 "It was made as the first bed cover for Barbara's son Michael who was born 8-2-64. It wasn't meant to be permanent but to make-do until a better one could be afforded. Woollen fabric was used so it could serve as an additional blanket." "When I made the bedspread, I really knew nothing about quilting. 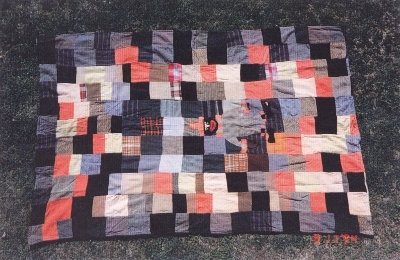 This was the first of many such patchwork covers made from woollen fabric scraps to be used � They acted as ground sheets or additional blankets � till I could afford 'better', which meant commercial sort like everybody else used. They were backed with old bedspreads, table clothes or cheap fabric. There was never three layers as I thought the wool was enough warmth. They were hardly quilted either. Just a couple of rows of stitching across the middle and a top stitch about 1/2" from the edge. The first one I made (i.e. the one I'm mainly writing about) was the only one I appliqued or decorated. Once they were replaced they were used for all sorts of tasks � like lining the boot of the car when we were collecting wood or other dirty items. It is only now I appreciate what the scraps of woollen fabric in them, really mean to me. I still have some, but the one above is gone. 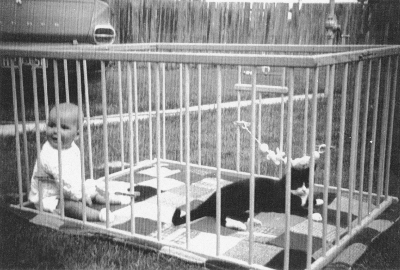 It was made as a ground sheet for that play pen."